A look at four of our favourite spas in the country! As far as we’re concerned, few remedies are more effective at curbing winter blues than time spent at the spa. These resorts are some of our favourite spots across the country. Pro tip: you'll want to have your sunglasses handy to take in these views. Quebec City, the capital of the province, is perhaps best known for its vibrant culture and historic charm. 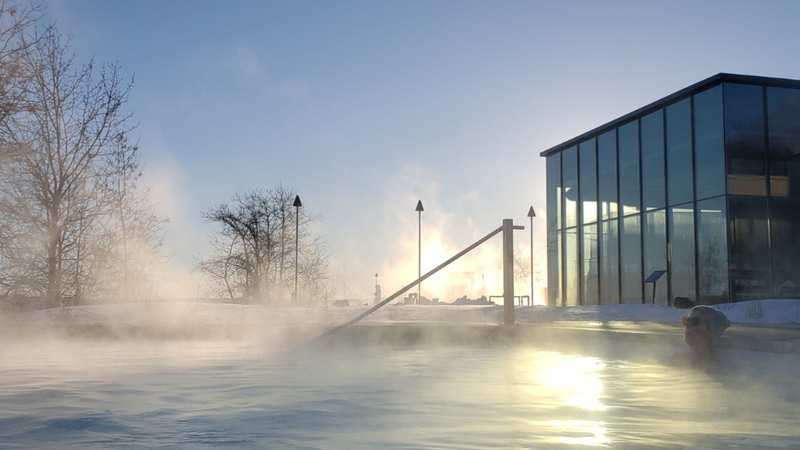 But it also happens to be home to one of the most scenic spas in the province, the Strøm Spa Nordique Vieux-Québec, a luxurious retreat located along the St-Lawrence River. Guillaume Lemoine says designers wanted the spa to be something unique. Given the interplay between the striking architecture and lush landscapes that surround it, we’d say they accomplished just that. The spa includes amenities like different types of massage treatments, a water circuit, indoor and outdoor relaxation areas, and much more. An hour and a half drive from downtown Toronto is a spa that's pretty unlike anything else in Canada, maybe even the world. That’s the Christienne Fallsview Spa, which has everything you know and love about a world-class spa, like facials, massages, and mani-pedis, but with the added bonus of a pretty spectacular view too. The spa’s panoramic windows overlook the stunning Niagara Falls, offering guests the view of a lifetime overlooking both the Canadian and American waterfalls. So if you’re seeking a weekend away from the hustle and bustle of the city then head out to the Niagara region—the ultimate setting for a romantic getaway with your significant other or a girls’ weekend with your besties. No matter who you’re there with, the Christienne Fallsview Spa will get you rested and rejuvenated while looking out at one of the most famous views in the country. Look up. Waaaay up. Because the Montreal skyline is where you’ll find one of the city’s best-loved spas. Spa Eastman Montreal is located on the 16th floor of a high-rise building on Sherbrooke Street, across from McGill University. An urban retreat with plenty to offer, Spa Eastman’s views of Mont-Royal is just one of a thousand things you’ll appreciate about your experience here. Yoga classes, a thermotherapy centre, and even beauty workshops are all on the menu at this luxe locale. But one treatment option that especially stands out is their facials, we're especially loving an all-new treatment that uses a technique called bio-draining. This is designed to deep-clean your pores and rid them of impurities. The treatment scans your face’s reflex zones such as your forehead, cheeks, and chin and drains these of excess fluids. The end result is refreshing, detoxifying, and totally worth the indulgence. From the shores of The Maritimes to the peaks of the Rockies, breathtaking views are pretty much the norm in Canada. For this next spa, we took a trip to the Pacific, a part of the country that is no stranger to extraordinary views. Whether you’re living there or just a visitor to the West Coast, then one resort we recommend you check out is the Oak Bay Beach Hotel in Victoria, British Columbia. In this hotel, you’ll find the Boathouse Spa & Baths. Billed as Victoria’s “only oceanfront spa,” the Boathouse Spa & Baths experience includes favourite features like a full range of massages, body wraps, and more. But its seaside mineral pools are a real sight to see (and experience). You'll get to enjoy head-to-toe relaxation all the while taking in an expansive, impressive view of the ocean. Soothing and breathtaking, all rolled into one visit.